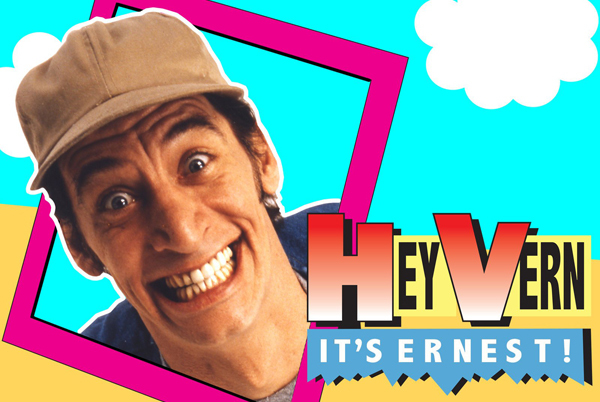 His name was Ernest P. Worrell, and he was everyone's favorite comedy character in the late 1980s, thanks to a series of popular television commercials and hit movies like "Ernest Goes to Camp" and "Ernest Saves Christmas." So it only made sense to give Ernest his own television series, and it's not surprising that it won multiple Emmy Awards. So why did "Hey Vern, It's Ernest!" only last one season? What made Jim Varney's character so popular, and what kept his TV show from hitting the big time? William Bibbiani and Witney Seibold examine this strange sketch comedy series, marvel at its bizarre construction, and try to come up with their very own episode. Follow the podcast on Twitter at @CanceledCast, subscribe on iTunes, follow your hosts at @WilliamBibbiani and WitneySeiboldm, and head on over to the Canceled Too Soon Patreon to help keep the show running and get access to even more exclusive C2S content!